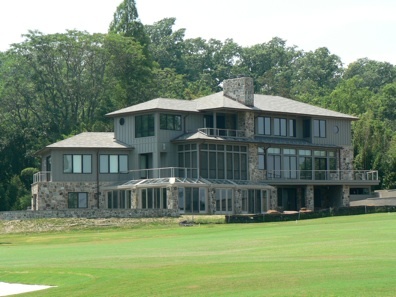 Your Source for Home Window Tinting in Richmond, VA. Lower your energy bill! Window film can impact your home in many positive ways. In an essence, our product is not window film, but the resulting benefits. Let us show you what life with window film is like. Our first product is longer lasting furnishings! Unfiltered sunlight contains more than the light we can see. It also contains ultraviolet rays (UV) and infrared rays (IR). The UV rays are the primary cause of fading. IR rays carry a large portion of the sun’s heat. This is important because heat is also a contributing factor in fading. Using the right window film allows you to select which parts of the light you let enter your home. You can select a film that allows the safer light in and leaves the harmful light out. 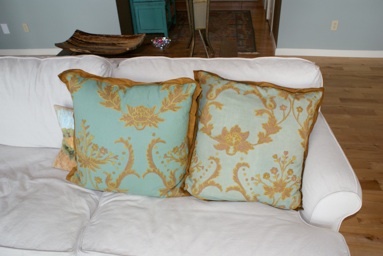 This picture shows how the sunlight has faded the pillow on the right. Unfiltered sunlight also damages wood floors, furniture, rugs, and artwork. 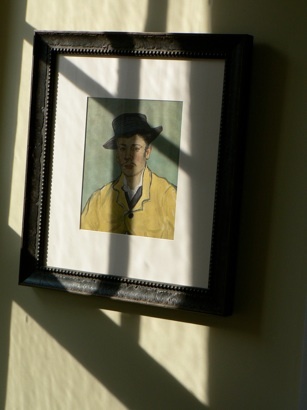 The picture on the left is of a painting protected with Huper Optik Select Acht. The home owner is in Richmond’s historic district and wanted to protect her furnishings without losing the historic integrity of her home. As you can see from the picture below, her film is barely even noticeable. The film is on the right side only! One of the most important aspects of interior design is light. Natural light plays a role in how we see color and how we feel. A bright sunny room is inviting and cheerful. The Huper Optik Select Acht and the Huper Optik Select Sech are two of our favorites because they stop harmful UV rays and even heat without changing the sunniness of your room. The room on the left is designed to embrace the view of the James. 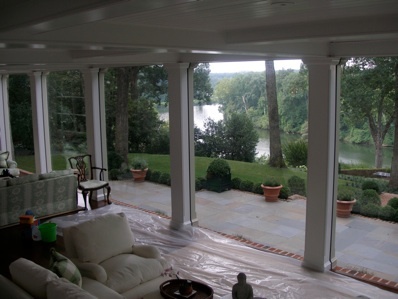 The homeowners wanted to protect their furnishings and control the heat without compromising the view. It was essential that the film be as invisible as possible and do the same work as darker, shinier products. The product they selected was the Huper Optik Select Sech. The second product we offer is lower utility bills. The home on the right is a beautiful modern home on Gibson Island, Md. Modern architecture allows us to use more glass than ever. With the glass comes excessive heat and excessive utility bills. The right window film can reduce your energy consumption and be beautiful. The homeowners chose Huper Optik Ceramic 30. Another product we offer is comfort. It’s hard to put a price on comfort. 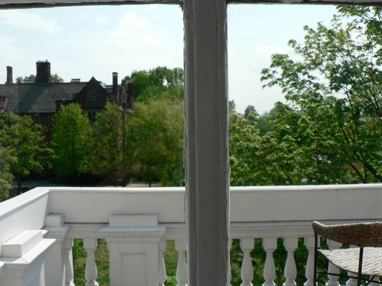 Window film reduces glare and heat, creating a pleasant home environment no matter where you are. 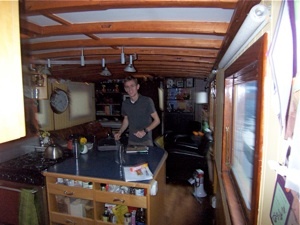 This is the homeowner on their houseboat in Seattle, Wa. In a 440 square foot home, comfort is essential. The homeowner chose Huper Optik Ceramic 40 for inconspicuous glare protection.